I don't know why I am drawn to wierd salsa combinations, but this strawberry and avocado salsa just seemed so interesting to me that I had to try it. I made it when my parents were here visiting, after my dad bought a large bag of avocados. I made it on a night when we were having tacos for dinner. We tried it with some tortilla chips and it was really good. Even though I forgot to add the sugar! My mother and I added some to top off our tacos and it was a really great addition. I was actually glad that I accidentally left out the sugar because it made the salsa seem savory, with just the right amount of sweetness from the strawberries. I noticed that a very similar recipe was in the May issue of Cooking Light, but was paired with Cinnamon Tortilla Chips. I am going to have to make it and compare the two. Make sure you go and see how the rest of the menu turned out! It does look delicious Mary Ann. I would love this to accompany so grilled chicken!! very intriguing, and I think the sweet tortilla chips would go great. Interesting - with sweet strawberries you wouldn't need any added sugar. I bet this would be good with grilled chicken. Wow! 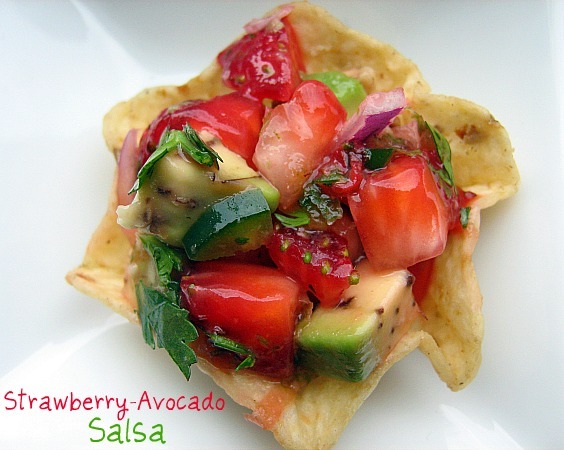 What a fun salsa! I just wish I lived at your house every night at dinner time! This looks different and very good! I've mixed fruit with avocado before, but never strawberries! Yum!